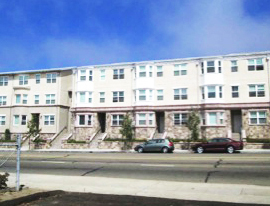 City Heights Ten, a City Heights Community Development Corporation and Wakeland Housing and Development Corporation rehabilitation project, was named Housing Project of the Year in the San Diego Housing Federation’s 2015 Ruby Awards held on April 24. 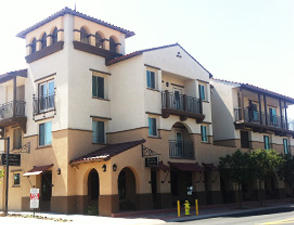 The Ruby Awards recognize excellence in affordable housing. City Heights Ten was honored in the rehabilitation category for providing high quality, affordable housing for families and seniors through the renovation of 132 homes across 10 developments in the City Heights neighborhood, as well as through enhancements to the community center. CCRC is honored to have been a part of this project, and we congratulate everyone whose hard work led to this exciting achievement. 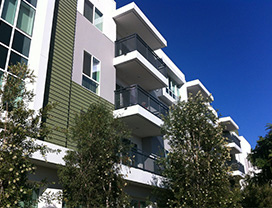 The grand opening for Sage Park Apartments, a Los Angeles complex developed by BRIDGE Housing Corporation, was held on April 23. Sage Park provides 90 affordable units for residents with incomes ranging from 30 to 60 percent of the area median income. The development, which was designed to receive LEED Silver certification, includes a fitness room, community room, community garden, laundry facilities and landscaped courtyards. 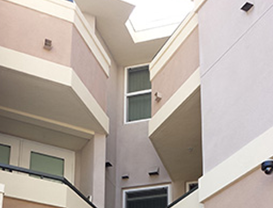 CCRC, Bank of America Merrill Lynch, Los Angeles Unified School District, Los Angeles Housing and Community Investment Department, the California Tax Credit Allocation Committee and New Generation Fund provided financing for the project. CCRC congratulates those involved in successfully completing this development, and we wish Sage Park’s new residents the best! 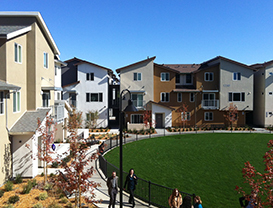 Arboleda, a new affordable housing community developed by Satellite Affordable Housing Associates, had its grand opening on May 14 in Walnut Creek. 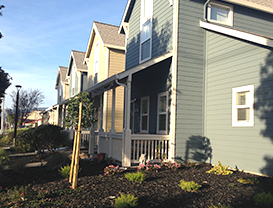 Comprised of two three-story buildings, Arboleda provides a total of 48 homes for low-income families and those with special needs. The development is LEED Platinum certified and features a mixture of one-, two- and three-bedroom apartments, including both two-story townhomes and flats. 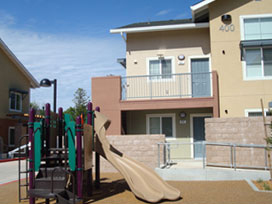 Residents also have access to a large community room, courtyard, computer room, children’s play structure and free Internet. 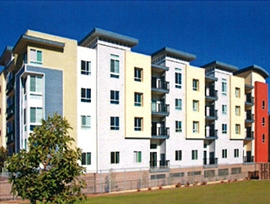 Financing for Arboleda was provided by CCRC, Wells Fargo Bank, the City of Walnut Creek, Housing Authority of the County of Contra Costa, Contra Costa County HOME Investment Partnership Act funds, the California Tax Credit Allocation Committee, California Housing Finance Agency, Contra Costa Behavioral Health Services, Federal Home Loan Bank of San Francisco, California Department of Developmental Services and Regional Center of the East Bay. 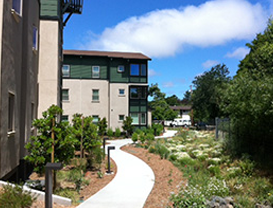 Congratulations to everyone who contributed to this project and to Arboleda’s new residents. CCRC is thrilled to announce the groundbreaking of five new CCRC-financed properties — Heritage Square, Cielo Carmel, Alice Griffith phase 1 and phase 2, and Sonata at Riverpark. 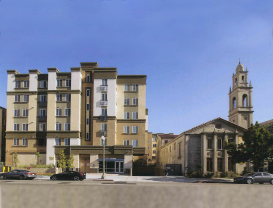 Heritage Square, a BRIDGE Housing Corporation development, will provide 70 units of affordable housing in Pasadena. 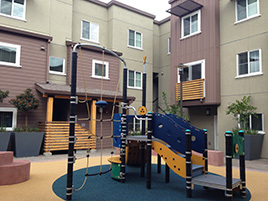 Alice Griffith phase 1 and phase 2, developed by McCormack Baron Salazar Inc. in partnership with the San Francisco Housing Development Corporation and Tabernacle Community Community Development Corporation, respectively, will provide 184 apartments for families in San Francisco. 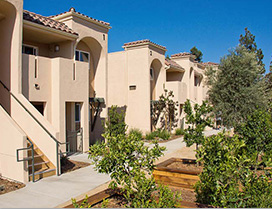 Developed by Affirmed Housing, Cielo Carmel will feature 197 homes in San Diego. 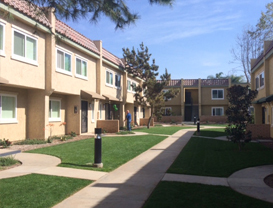 Sonata at Riverpark, developed by Retirement Housing Foundation in Oxnard, will offer 50 affordable units. CCRC is excited to be a part of these new developments, and we wish everyone involved the best of luck! 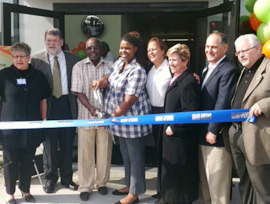 On April 25, CCRC celebrated the grand opening of Meta Housing Corporation’s new Pacific Arts development in San Pedro. 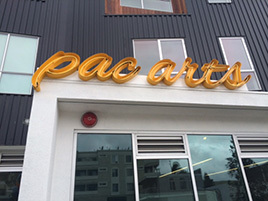 Intended to provide affordable housing for families in an art-centered community, Pacific Arts features 48 apartment units, as well as art studio space, a workshop area, soundproof room, computer room and street-level gallery space. 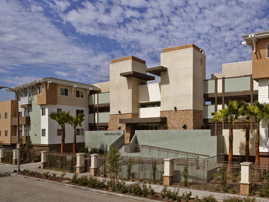 CCRC helped finance the project, along with Bank of America Merrill Lynch, the Community Redevelopment Agency of the City of Los Angeles, Los Angeles Housing and Community Investment Department, and the California Tax Credit Allocation Committee. We extend a warm welcome to Pacific Arts’ new residents and a heartfelt “thank you” to everyone involved in its completion. Lending Team: CCRC was happy to help with this $25-million project by providing a $1.6-million permanent loan and a $1-million Section 8 loan. AEGON USA acted as the tax credit investor and posted $6.6 million in federal tax credit equity. Other financers include the Town of Windsor, Sonoma County, California Dept. of Housing, and others. 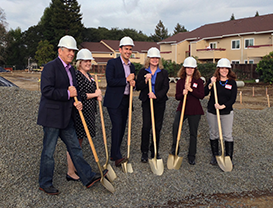 Lending Team: CCRC is a proud member of the financing team for this project, along with the City and County of San Mateo, Wells Fargo Bank, Union Bank, HEART of San Mateo County, Enterprise Foundation, and the California Department of Housing and Community Development. Lending Team: Construction lender was Silicon Valley Bank, tax credit investor was US Bank. Additional financing provided by City of Healdsburg. 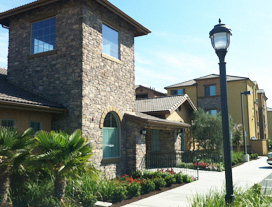 CCRC provided an $800K permanent loan on this award winning project. Development Team: Watts Labor Community Action Committee and Affordable Housing CDC, Inc. Lending Team: CCRC was proud to be among the financing team for this project, which also included funds provided by both the City and County of Los Angeles, as did US Bank. Adding the apartment communityâ€™s $26 million development cost with its $16 million project-based valuation of the Section 8 contract, McCoy Villa is valued at an aggregate $42 million. 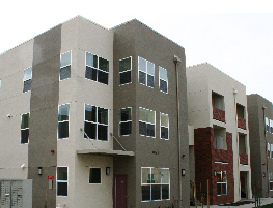 Lending Team: The $25-million development received an award of $13.3 million in low-income housing tax credits. 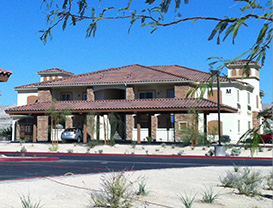 CCRC contributed by approving a $2,680,000 commitment for a permanent loan. Other financing partners include JP Morgan Chase, Housing Authority of the County of Los Angeles, Hudson Housing Capital, California Tax Credit Allocation Committee, Los Angeles Housing Department, and State Housing and Community Development. 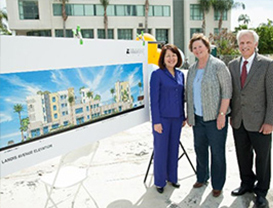 Lending Team: The Long Beach Housing Development Company invested $9.9 million of redevelopment 20% Tax Increment Housing Set Aside funds for the project. The City of Long Beach also provided $9.3 million for the project. Red Stone Equity Partners acted as the tax credit investor. Development Team: AMCAL Multi-Housing, Inc. Lending Team: Citibank, California Tax Credit Allocation Committee, National Equity Fund, Inc., California Department of Housing and Community Development, the U.S. Department of Agriculture, and more. 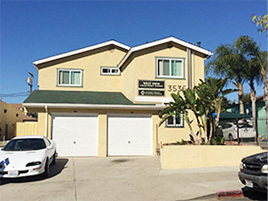 Lending Team: California Housing Finance Agency’s Mental Health Services Act Housing Program brought $1.6 million toward the $24.4-million project. 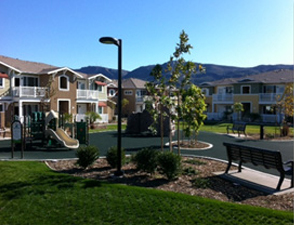 CCRC and the Redevelopment Agency for the County of Riverside also provided permanent financing. 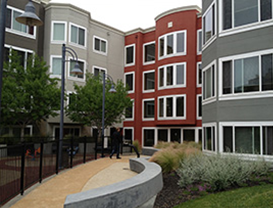 Lending Team: CCRC financed the project along with the City and County of San Francisco, Wells Fargo Bank, and the California Department of Housing and Community Development. Development Team: Eden Development Inc.
Development Team: Retirement Housing Foundation? 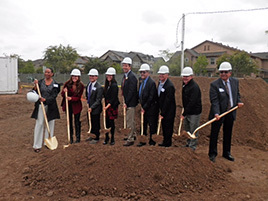 South Hayward BART Family & Seniors Communities – CCRC is excited to announce that the South Hayward BART Family & Seniors Communities, developed by Eden Housing Inc., broke ground in Hayward on September 15, 2015. In addition to providing 87 affordable apartments for families and 64 affordable apartments for seniors, these communities will offer a large courtyard with playground, community gardens, computer centers, and a barbecue area with picnic tables. The buildings are designed with sustainability in mind and have achieved a Green Point rating of 149 as well as ENERGY STAR certification. 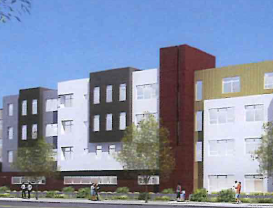 Financing for the project is being provided by CCRC, Wells Fargo, the City of Hayward, the California Department of Housing and Community Development, the County of Alameda, the Federal Home Loan Bank of San Francisco, TCAC and CalFHA. CCRC wishes the best of luck to all those who are helping bring the South Hayward BART Family & Seniors Communities to fruition. A CCRC-Funded Property Receives Homes Within Reach Award – The Southern California Association of NonProfit Housing (SCANPH) recognized New Pershing Apartments, a Skid Row Housing Trust development, which provides 69 apartment homes for formerly homeless and low-income individuals, as Homes Within Reach Award recipients at the annual housing conference held on Sept. 17-18th, 2015. 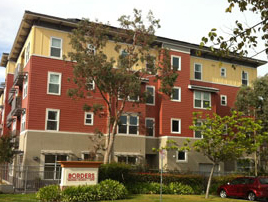 SCANPH’s Homes Within Reach Awards honor developers, projects, and lenders for outstanding work in affordable housing. New Pershing Apartments received the Transformative Communities award, which honors projects that contribute positively to the surrounding community. CCRC Held its 26th Annual Membership Meeting at 1180 4th Street – 1180 4th Street features 99 affordable rental homes for very-low and low-income families and 50 affordable units for formerly homeless households. The community straddles San Francisco’s South of Market neighborhood and the new Mission Bay area, home to a new campus and medical center for the University of California, San Francisco. A large community room serves the residents of 1180 – 4th Street and is open during weekdays for the after school program for grade school children living at the building. A restaurant will anchor the corner of 4th and Channel Streets and the remaining 5-7 commercial spaces will be marketed to neighborhood-serving commercial tenants and will extend down the 4th Street commercial corridor wrapping around Longbridge Street. A resident property manager lives on-site. Environmental features: Energy Star washers, dishwashers and refrigerators, Energy Star Advanced Lighting package, recycled gray water/rain water irrigation system, no or low VOC products, use of environmentally friendly building material (recycled content materials), construction waste recycling/minimization which diverts at least 25% of construction waste from landfills and recycles at least 75% of construction and material waste. New Pershing Apartments Skid Row Housing Trust Receives Homes Within Reach Award – The New Pershing Apartments is the transformation of a century-old Single Room Occupancy (SRO) hotel in Downtown Los Angeles into a modern, sustainable, mixed-use, mixed income development with 69 studio and one bedroom apartments for formerly homeless and low-income individuals. 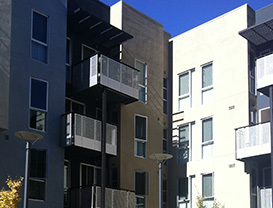 Skid Row Housing Trust preserved the previous building’s historic Victorian facade while eliminating its substandard infrastructure and layout in favor of a more modern and spacious interior. In addition to providing homes for some of Los Angeles’ most vulnerable residents, the New Pershing Apartments features three ground floor commercial spaces that will activate both 5th and Main streets with retail and dining options. Furthermore, the New Pershing will achieve Gold Certification through USGBC’s LEED for Homes program, incorporating sustainable elements such as community gardens and solar thermal panels. 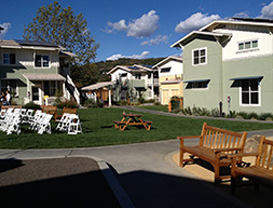 Casas de las Flores– The grand Opening of Casas de las Flores Family Apartment complex developed by People’s Self-Help Housing (PSHH) in the City of Carpinteria was held on October 15, 2015. 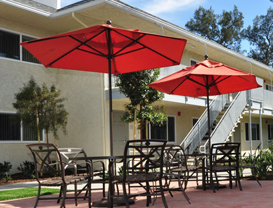 Built on a former site of Carpinteria Camper Park, Casas de las Flores provides 43 apartments and features a community room and kitchen, youth learning center with a computer room, a playground, and laundry facilities. The development was financed by CCRC, National Equity Fund, JP Morgan Chase & Co., the County of Santa Barbara, NeighborWorks, and TCAC. We thank everyone who contributed to this project and extend a warm welcome to Casas del las Flores’ new residents. CCRC congratulates PSHH for the completion of Casas de las Flores, their 40th development completed in its 40th year of operation.